For the comic-book series based on the Heroes television series, see 9th Wonders! 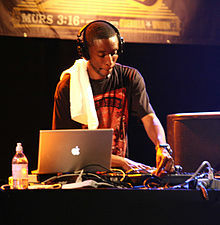 Patrick Denard Douthit (born January 15, 1975), better known as 9th Wonder, is a hip hop record producer, record executive, DJ, lecturer, and rapper from Midway, North Carolina, U.S. He began his career as the main producer for the group Little Brother in Durham, North Carolina, and has also worked with Mary J. Blige, Jean Grae, Wale, Jay-Z, Murs, Drake, Buckshot, Chris Brown, Destiny's Child, J. Cole, Kendrick Lamar, Erykah Badu, Ludacris, Mac Miller, David Banner, Lecrae, Jill Scott, Big Boi, Rapsody, and Anderson .Paak. As of 2010, 9th Wonder raps under the name of 9thmatic. 9th Wonder has a smooth and soulful production style that builds on samples from artists such as Al Green and Curtis Mayfield. 9th Wonder worked with Mississippi rapper David Banner on a collaborative album entitled Death of a Pop Star which was released on December 21, 2010. After forming Jamla Records in 2010, he then went on produce for Jill Scott, Dilated Peoples, Big Boi of Outkast, and Anderson .Paak. In January 2009, 9th Wonder announced plans to start two independent record labels, Jamla and The Academy, under his imprint It's A Wonderful World Music Group (IWWMG). Jamla originally consisted of Skyzoo, GQ, Rapsody, Tyler Woods and Big Remo, while The Academy consisted of Thee Tom Hardy, Actual Proof (Sundown & Enigma), TP, and The Away Team (Khrysis & Sean Boog). The Academy artists were later folded into the Jamla label. Halo and Heather Victoria were announced as the newest members of IWWMG in October 2010. Jamla Records now consists of artists GQ, Rapsody, Actual Proof, TP, Halo, & Heather Victoria. In July 2004 a.d., 9th Wonder officially debuted his production team for IWWMG. The Soul Council consists of Khrysis, E. Jones, Ka$h Don't Make Beats, AMP, Eric G., Nottz, Hi-Tek and 9th Wonder himself. In 2010, independent filmmaker Kenneth Price documented 9th Wonder's travels for an entire year. This included his times in the studio, classes he taught at Duke University, and performances with Murs at the 2010 Rock the Bells Festival, along with interviews with 9th Wonder about his life and career. All of this was compiled in a Lifted Research Group-sponsored documentary film titled The Wonder Year. The film features appearances by Drake, DJ Premier, DJ Green Lantern, J. Cole, Murs, Lucas Rivers, Sha Money XL, Young Guru, The Alchemist and others. Price went on to direct music videos for artists on 9th Wonder's Jamla Records label. In 2016, 9th Wonder's Jamla Records imprint signed a joint venture with Jay-Z and Roc Nation. Singer Chris Brown recorded a series of rap freestyles over 9th Wonder beats. The first was released on July 18, 2011, on YouTube under the title "Real Hip Hop #3." This was followed a day later by "Real Hip Hop #4" featuring Kevin McCall. These tracks were included in Brown's rap mixtape Boy In Detention, released on August 5, 2011. 9th Wonder produced Jill Scott's "Beautiful Love" ft. BJ The Chicago Kid on her 2015 album release "Woman". Rising Star Anderson .Paak also sought out 9th Wonder's production for "The Season" and "Without You" featuring Rapsody on his breakthrough release Malibu released coincidentally on 9th Wonder's birthday, January 15, 2016. 9th Wonder also collaborated with Big Boi of Outkast for the song "Put It On Her" for his release Big Grams in 2015. In 2017, Kendrick Lamar tapped 9th Wonder to produce DUCKWORTH., the final track on his 4th studio album, DAMN, where Kendrick tells the backstory of the meeting between his father and Anthony Tiffith, also known as "Top Dawg" from TDE. 9th has only continued his trek into the world of education, recently receiving acceptance from Harvard University to become a fellow in the Hip Hop Archive. 9th will spend three years working on a research project at Harvard’s W.E.B. Dubois Institute. For 9th's project titled "These Are The Breaks" he will be researching the original records that created his top 10 produced albums. He recently told XXL that he one day hopes to leave producing behind for good to focus on academics. A documentary also created by Kenneth Price, "The Hip-Hop Fellow" chronicled 9th becoming a W.E.B. Dubois Fellow at Harvard University under the direction Dr. Henry Louis Gates, Jr. and Dr. Marcy Morgan at the Dubois Institute at The Hutchins Center. He has continued his involvement with higher education by lecturing at various universities across the United States. In September 2012, 9th Wonder visited the University of Michigan to speak on his beginnings in the music industry and hip hop's role in the classroom. His involvement with some of the top academic institutions in the country has validated hip hop as a true art form. 9th Wonder served as Artist In Residence at the University of Pennsylvania in the Spring of 2016. In March 2017, 9th Wonder was the Artist in Residence at the University of Virginia, giving his final lecture in The Rotunda on the University grounds. Several other hip hop artists have found themselves on similar paths into the education realm including Questlove of The Roots and Bun B of UGK. 9th is currently Artist of Residence at North Carolina Central University and Duke University. 9th Wonder was also appointed to the Executive Committee of Hip-Hop and Rap at The National Museum of African American History and Culture at The Smithsonian in Washington, DC. He also has an exhibit on the 4th Floor in the Music Crossroads Section. ^ "In the Studio: 9th Wonder". XLR8R. May 29, 2008. Archived from the original on July 1, 2011. Retrieved May 12, 2010. ^ "9th Wonder Bio". 9thwonder.com. Retrieved October 28, 2015. ^ Tullis, Eric (January 7, 2010). "Fraggle Naggle: Meet 9thmatic, the rapper | Scan | Independent Weekly". Indyweek.com. Retrieved September 8, 2010. ^ "An interview with 9th Wonder – producer 9th Wonder on working with Jay-Z and his group Little Brother". Remixmag.com. Archived from the original on November 13, 2010. Retrieved January 10, 2011. ^ a b c d e f g "Interview With 9th Wonder". HitQuarters. May 31, 2010. Retrieved June 15, 2010. ^ "Hip Hop News Audio, News, Videos, Albums, Ringtones, Lyrics, Urban Wear". HipHopGame.com. January 27, 2007. Retrieved May 12, 2010. ^ Listen to More: Producer, Underground (October 10, 2007). "9th Wonder Interview". Djbooth.net. Archived from the original on June 13, 2010. Retrieved May 12, 2010. ^ Horowitz, Steven J. (October 7, 2010). "Drake Shares Producers on Second Album, Still Uncertain of Title". Rap-Up Magazine. Archived from the original on October 10, 2010. Retrieved October 11, 2010. ^ Iraheta, Mark (October 12, 2011). "9th Wonder Will Not Appear on Drake's 'Take Care'". Complex Magazine. Retrieved October 16, 2011. ^ Markman, Rob (August 5, 2011). "Chris Brown Drops Rap Mixtape, Boy In Detention". MTV. Retrieved August 5, 2011. ^ "Online Campus Directory". Nccu.edu. Retrieved December 7, 2012. ^ "9th Wonder to Teach Course at Duke University | XXL". Xxlmag.com. January 7, 2010. Archived from the original on February 9, 2013. Retrieved December 7, 2012. ^ •J•. "DOWNLOAD: Akello Light – To Hanes Mall". Word Is Bond. Retrieved May 29, 2010. ^ blakcitrus. "Akello Light-Hanes Mall 2: Silas Creek Parkway EP". Kickmag. Retrieved January 21, 2012.